Metal roofing’s Class A fire rating helps shield homes from flying sparks and embers. Photo courtesy of American Metal Roofs of Michigan. PORTLAND, Ore.—July is peak wildfire season, the Metal Roofing Alliance (MRA) is urging homeowners to consider ways to better protect their homes. That’s especially true in the Western U.S. and Canada with recent hot temperatures and winds only exasperating the problem and making the danger of fires starting in nearby communities and threatening homes a very serious issue. Roofs are especially vulnerable to flying embers from nearby wildfires, which can travel up to a mile away. 7 Tips To Prevent Roof Fires from Metal Roofing Alliance on Vimeo. To help protect homes, FEMA recommends that in fire-prone areas, if a roof is covered with wood or asphalt shingles, homeowners consider replacing it with a fire-resistant material, such as metal. Metal roofing has a Class A fire rating, the highest available. An unrated roof is the most vulnerable to fire and includes materials such as non-fire-retardant treated wood shakes or shingles. Wildfire season in North America starts earlier, lasts longer and affects more areas than ever before, making it a priority for homeowners to consider better ways to protect their homes against the increasing threat. Over the past 12 years, every state in the western U.S. has experience an increase of large wildfires per year, compared to the annual average from 1980 to 2000. Create a defensible barrier. Trim tree branches away from the roof. Keep gutters clean as dried leaves and vegetation can create the ideal ignition conditions for a wayward spark. Pay attention to your roof’s components. Use only vent covers that will not readily burn or melt. Maintain your roof all year long. Have a professional roofer inspect your roof, clear off flammable debris and repair any missing or damaged components to prevent embers from nestling into vulnerable or exposed areas. 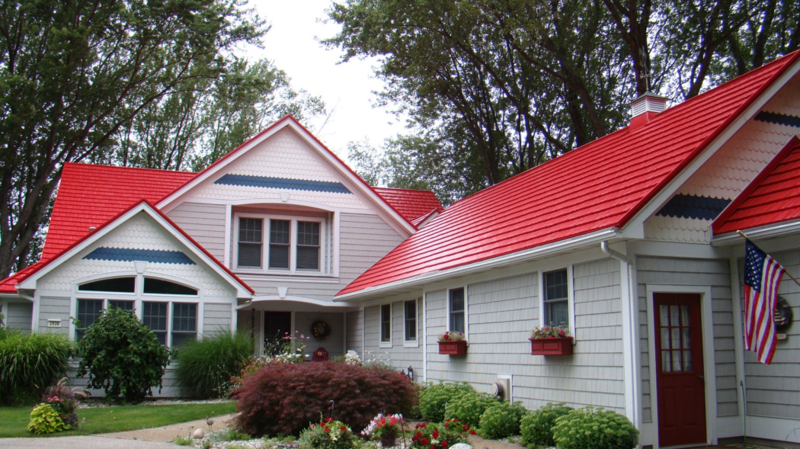 When reroofing, consider long-term performance and protection. Choose durable, nonflammable materials, such as metal roofs, and ensure your roof has a Class A rating for fire-resistant performance, especially near any wildfire-prone area. Focus on your surroundings when using fireworks. Only use legal fireworks in a safe area, completely away from dry fields, forests and buildings. Keep water, a garden hose and garden tools nearby to safely extinguish fireworks and obey all local ordinances regulating the sale and use of fireworks. Watch as ABC News covers how metal roofing contributed to saving one family's home from a wildfire.